A few weeks ago, a friend dropped by for dinner. Having no set plans for what to make, we scrounged around my apartment but, to borrow a line from Old Mother Hubbard, the cupboard was bare. Well, not entirely bare. (This is my kitchen we’re talking about here.) There were eggs in the fridge and onions in the basket. And then we found 2 slices of good old American cheese. An omelette was on the agenda. More correctly, it was on the menu. Even more correctly, it was the menu. We sautéed the onions, then let them brown even more. We cracked a handful of eggs (literally, one for each finger) into a bowl, whisked them up with a bit of milk, and poured them in the pan. They bubbled a bit and we lowered the heat and pushed the mix around , scraping up the cooking edges and letting the raw egg flow underneath. We salted and peppered and dropped down the cheese. A few more minutes and we folded the omelette onto a large plate and dug in with two forks. One taste and the omelette reminded me of something. Another taste. And another. And then it came to me. The omelette tasted like Passover. The holiday when dietary restrictions can make life difficult for a week. Especially when one likes to eat as much as I do. Especially when one refuses to eat matzah or matzah meal (finely ground matzah crumbs used like flour) after the seder. Save for the occasional matzah ball. So we finished the omelette and enjoyed the evening. And that was that. But that wasn’t that. I had to get that omelette out of my mind. Denial about the upcoming Passover holiday (it’s now in 2 days!) can be a powerful motivator. And so the next morning, I awoke with a craving for another omelette. I know, I know, that’s a lot of eggs in less than 24 hours. But I was determined to redeem the omelette with another that bore nary a resemblance to traditional Passover food. So I scrounged a bit more and I found some arugula. Bingo! 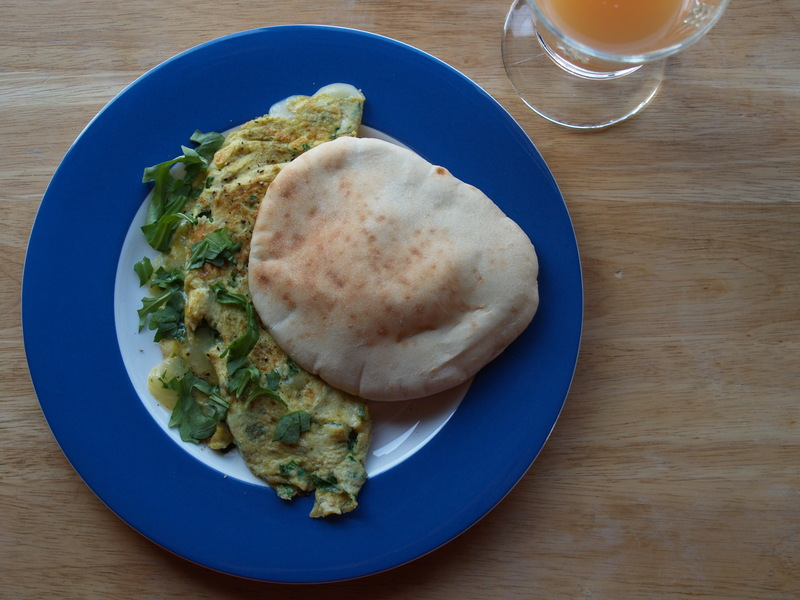 The peppery, slightly bitter green holds up quite nicely in an omelette, developing a delicate, not-mushy wilt. To keep with the Passover theme, some of my Sephardi friends place arugula on their seder plates in lieu of the Ashkenazi horseradish. A tour of my spice rack turned up some cumin. And then there was a handful of shredded mozzarella lurking in the back of my fridge. Breakfast eaten, I hopped in the car to buy groceries. Turn burner to medium-high and add a pat or two of butter to a nonstick pan. While the pan is heating and the butter is melting, whisk together 2 eggs and a splash of milk. 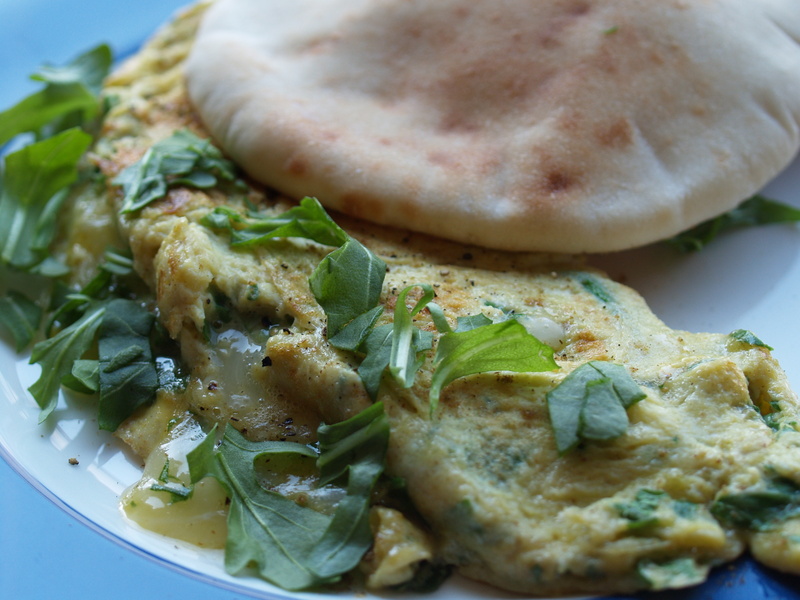 Chop up some angula (or fresh herbs – parsley, chives) and whisk into the eggs. Pour the egg mixture into the pan and swirl so that it covers the entire bottom. With a spatula, start to drag the cooking edges into the center, tilting the pan to help the runnier egg in the center move to the edges. Lower the heat a bit and work your way around the entire pan like this a few times. Don’t let the eggs firm up yet. Sprinkle with a handful of shredded mozzarella (or other mild cheese), a few grinds of pepper, a nice pinch of salt, and a really nice pinch of ground cumin. Bonus points if you first toast cumin seeds and then grind them really fine with a mortar and pestle, but I can’t imagine quite that much work in the morning while my coffee is brewing. Give the cheese a minute or two to melt. When the eggs are still a little runny, fold over one edge of the omelette towards the center. Loosen the rest of the egg, and then slide it onto a plate, flipping the folded edge over. Sprinkle with a few more grinds of pepper and some extra arugula/herbs. I love a good omelet for breakfast on most mornings. I have had an obsession with bell pepper mushroom and Swiss lately!